All content, artwork, and photos are copyrighted 2007-2010 gigglepotamus, unless otherwise noted. Sharing is fun, stealing is not. Feel free to link to this site, but please don't use any of my images or words without express permission from me first. 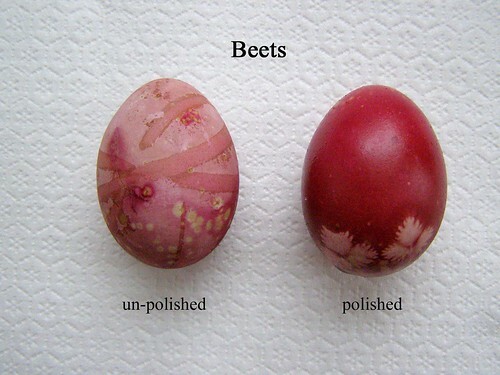 It’s official- spring has sprung, and egg dying season is upon us. Growing up, we always purchased food coloring kits, but if you’d like to try something a little more traditional, then please read on. Natural dyes do take a little longer than their chemical counterparts, but I think the results are worth it. 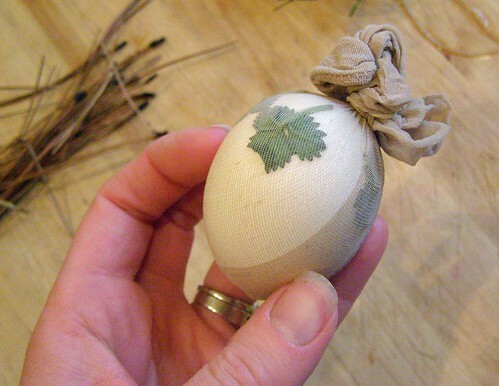 I like the idea that dying eggs can be safe for the environment, both by using natural elements as well as less packaging, while also paying homage to how I imagine our ancestors must have done it. For this tutorial, I have also included a stencil technique if you’d like to add an additional layer of interest to your eggs. 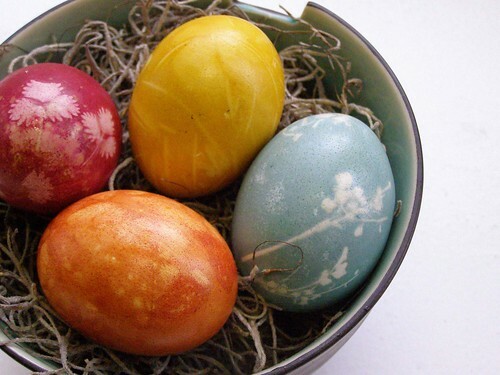 Since the natural dyes leave the eggs somewhat dull, you can polish them when they’re dry with a little bit of oil. As you can see from the photo, the oil polish (I used canola) also deepens the color quite a bit. For the egg on the left, I tried tying rubber bands around it to give it more texture. 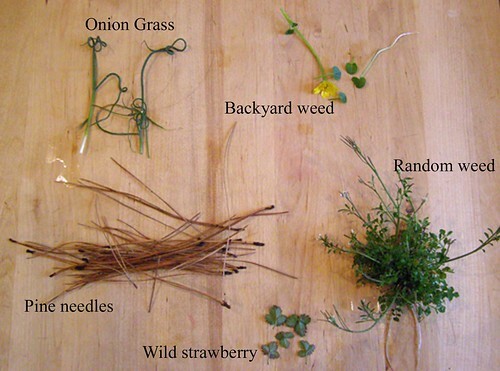 For the one on the right, I used wild strawberry leaves as a stencil. Boil one head of chopped cabbage for about 30 minutes. Strain the liquid, and add ¼ cup white vinegar and ¼ cup of salt and your eggs so they are covered. 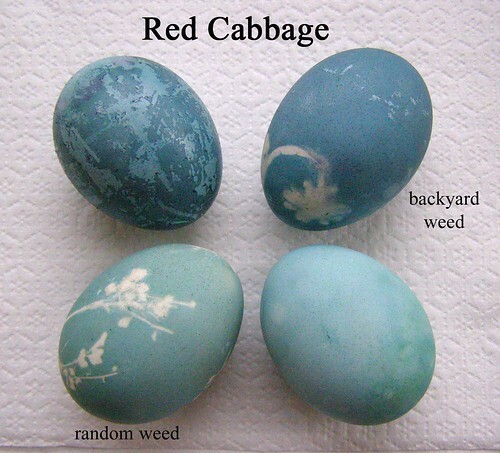 Not only will the eggs turn a beautiful shade of blue, but you can see the difference between leaving them in the dye bath for several hours vs. about an hour (bottom eggs). 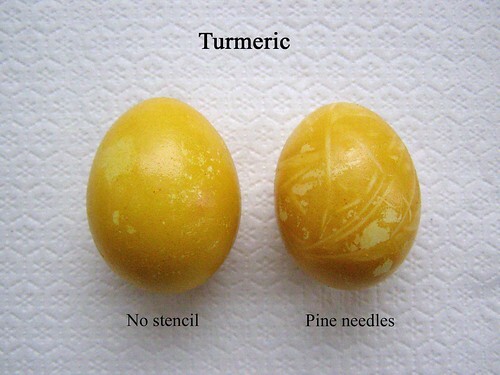 For the turmeric eggs, I boiled one cup of water with 1 T. turmeric, 1 T. white vinegar, and 1 T. salt. I transferred the mixture to dye cups & immersed my eggs for only about an hour. 2 cups yellow onion skins boiled with 2 cups water, 1T. vinegar, & 1 T. salt. 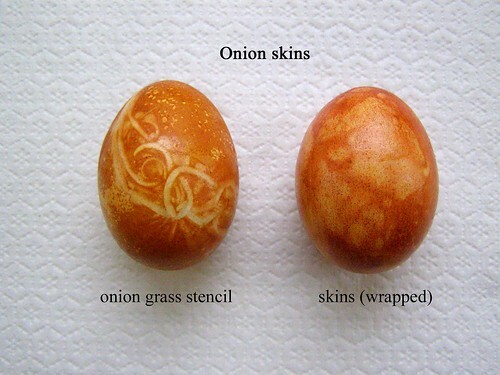 I wrapped the one on the right in onion skins with nylon over top, and it came out with a really cool marbled texture. I thought I’d share a book that was given to the kids by their grandmother some time ago, and I’ve since fallen in love with it. 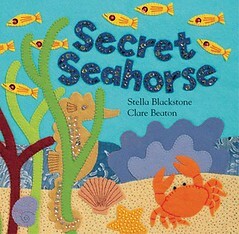 The Secret Seahorse, by Stella Blackstone. It’s a cute little story that has an added element of a hidden seahorse in each full-page spread. Even though the boys have read it enough times that the little seahorse’s secret is out, they don’t grow tired of it. Neither do I. More than the story, however, I find that the pictures are what keep me coming back time and time again. As a child, I wasn’t much for reading, but I loved getting lost in intricate illustrations of sea life, forest life, anything nature-oriented. I guess not much has changed! All of the illustrations are done in felt and vintage fabrics, buttons, trims, and stitched by hand. The bright colors, the rich layouts, and the intricate detail are just fascinating to me. I guess being an artist who also fell in love with fabric, this is something that I find wildly inspiring. The artist, Clare Beaton, clearly has some skills. Not only is it obvious the woman can draw, but her stitching is impeccable. Her work, to me, is the perfect marriage of the two mediums. If you check it out, I hope you find it as charming as I do. I’m curious… what’s inspiring you lately (doesn’t have to be a book)? You can either print them out onto white paper, then let your little (or big) person draw their masterpiece within the frame, or, go a little further and print it on a color paper of your choice, cut out the middle, & frame around an existing drawing. 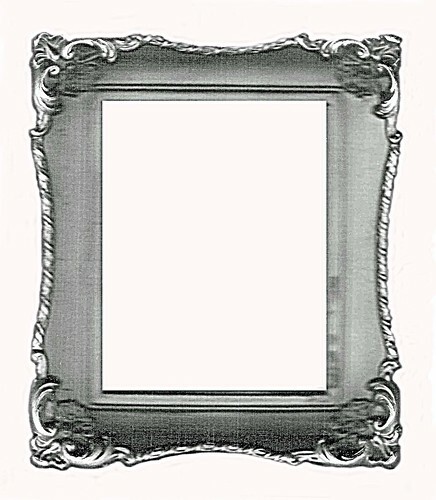 I was also thinking these frames might be cute for other paper projects, such as collages, silhouettes, etc. Have fun. You’ll have to resize the images from your print preview screen to at least 150%, but no larger than 167% for the rectangle, or 187% for the oval to get the most out of your 8½” x 11″ sheet of paper. Sorry for the confusion! snownami · cold · baking · sewing · sinus infection · pediatrician · no school · homemade valentines · cabin fever · uno · jello jigglers · spaghetti · snow · shovelling · back aches · mahna, mahna · giant cookies…mmmm · pj’s · couch cushion fort · netflix · paul blart, mall cop · legos · laptop · work from home · baby shower · lasagne · candy hearts · tylenol · holy cow, more snow! · jackson’s first steps · bruises · bumped heads · hide and seek · bunco · glitter glue · baby quilt · panda bear pants · cuddles · down comforter · sick kitty · the monster at the end of this book · target · score! alton brown tickets! 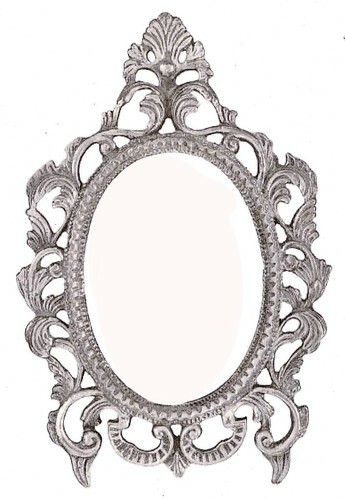 · superbowl · go saints · snow puddles · inside voice, please! · don’t hit your brother · wipe your feet · the “incident” with the hair clippers · stop hitting your brother · cordon bleu · yuck! I’m not eating that! · wyatt, don’t touch the computer · bologna · IF YOU HIT YOUR BROTHER ONE MORE TIME I’M GOING TO EXILE YOU TO ANTARTICA!!! Like most of those on the NE Corridor, we are in the midst of snownami 2010, which equates to very excited little boys bouncing off the walls at 6 o’clock in the morning. Good thing I’m a morning person!Anyway, in addition to the digging out and snow play that will be happening, one of my favorite things to do on a cold, blustery, wet, or otherwise nasty day outside is to bake. It’s something that the kids enjoy doing with me, and, * BONUS *, you’re left with something yummy when all’s said & done. Since I volunteered to bring something in for Wyatt’s pre-school Valentine’s party tomorrow, I was already prepared for some time in the kitchen. When Jackson turned one last month, his birthday fell on a Wednesday. To make it easier on everyone, we decided to have a brunch on the Sunday before to celebrate, complete with cake, ice cream, singing, etc. That left us with the question of what to do on his actual birthday. I didn’t want to do a whole other cake, but I also wanted to celebrate in some small way, too. At some point I thought it would be fun to try making one of those giant cookies that you get at the mall. It couldn’t be that difficult, right? And my favorite go-to website for all things recipe-related, All Recipes, just happened to deliver on my search request of “giant cookie”. I have to say, it was super easy, and SO delicious! I used a recipe I had on hand to make the icing, and pulled out my Wilton pastry tips, but honestly, store-bought frosting works just as well, if not better. I tinted mine with some food coloring & piped it through a freezer bag with the pastry tip on the end. One more thing: you don’t need the icing, or an event for that matter, to enjoy these cookies! If anyone tries them, I’d love to hear how they turn out.